Friday night, January 31, 2014 at 9:00pm a UFO suddenly appeared over the houses at Richmond Beach. When it was first sighted the UFO was at a very low altitude, no more than fifty feet. It flew very slowly southwest towards Puget Sound. It slowly gained height but seem to maintain a constant speed of ten miles an hour. The object was a glowing orange in color and had a glob like shape. Not four minutes later a companion UFO followed the route of the first one. When the third UFO appeared I ran to get my camera to document this Roswell like experience. Believe it or not at least fifteen UFOs were sighted. Several times three or four were visible at the same time. Man, what a night! 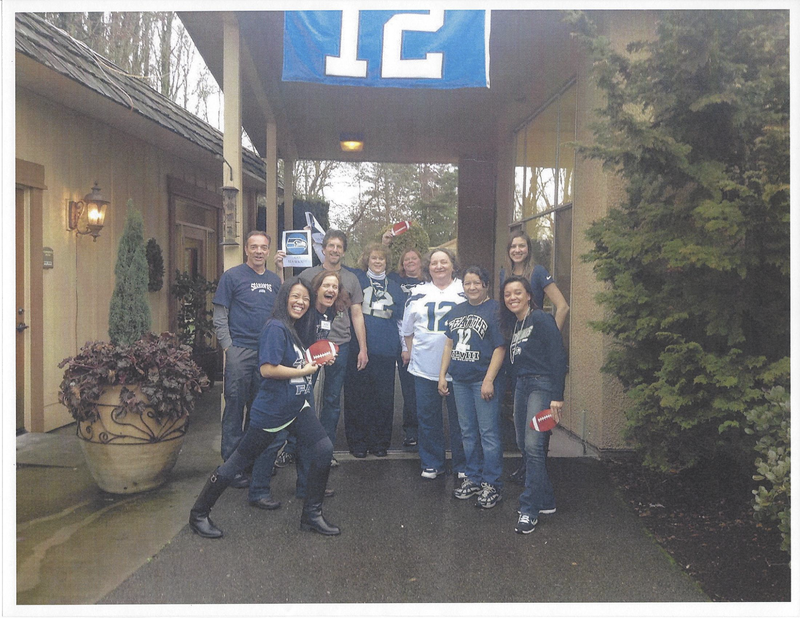 Anderson House staff rally for the Seahawks on Blue Friday. Anderson House is a retirement and nursing community located on 15th NE in North City. 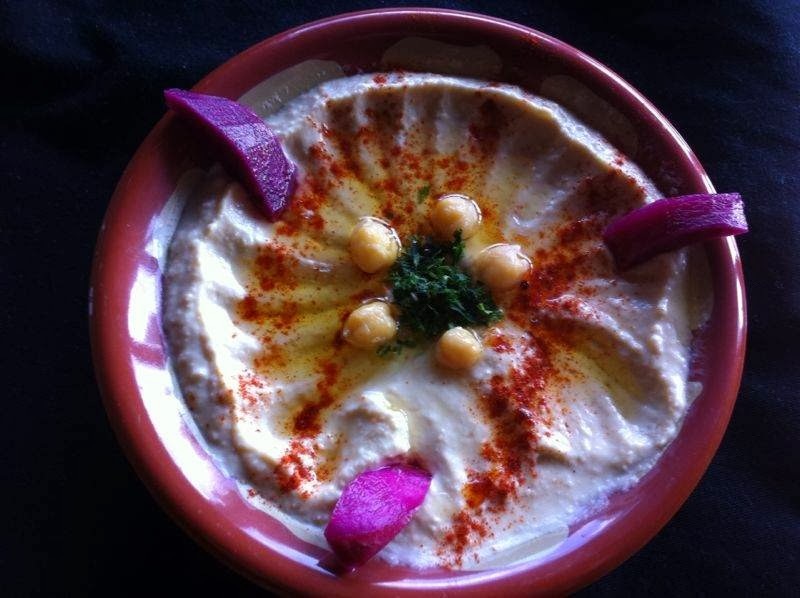 I usually don't publicly gush about restaurants but I've eaten at Hummus Bistro a few times and I needed to shout YUM! It's definitely an inconspicuous little place. Not something I would see driving by and have a burning desire to try. But, it just so happens that my neighbor in Ridgecrest introduced us to some friends that moved here from Syria. They arrived in Washington a little more than a year ago and opened Hummus Bistro in the small space that used to be La Casa Azul. This evening I enjoyed succulent Chicken Shawerma, a tasty Greek salad and, of course, hummus! I am a big fan of hummus and theirs didn't disappoint. All I could have asked for was a larger portion (a vat or trough would work)! The food was presented beautifully and everything was very fresh and flavorful. 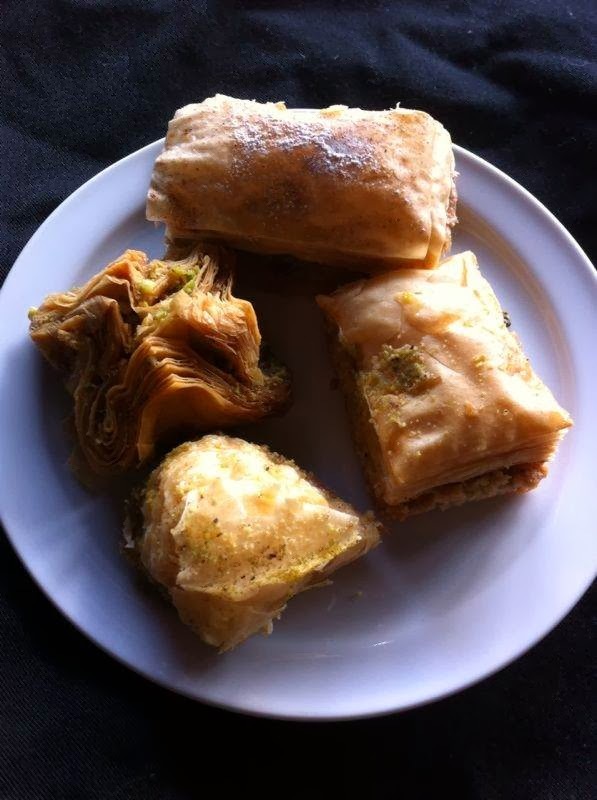 For dessert, we had sticky baklava and a cornbread-like cake soaked in the same gooey honey yumminess. Oh my, it was SO good! I would stop there just for that. The dinner prices are more than reasonable, plus I see they have a special lunch menu of wraps, but I haven't tried those yet. Also, we were told that they will soon have their liquor license and plan to host intimate music performances in the near future. Anyway, if you like Mediterranean food and you don't want to drive the U-District or Pike Place Market, you've got to check this little place out. Too bad it's not 50 feet north! The Crest Theater, located in Shoreline, is a great theater with great movie prices. The price for all 2D movies is $3, and the price for 3D movies is $4.50. The Crest is a great place to go if you are not looking to spend a lot of money on a movie or if you have that craving for movie theater popcorn. The staff at the Crest is very friendly and courteous. Also, there are free refills on large popcorns and large sodas (which is pretty cool). The Crest Theater is a fun, small, affordable theater that I recommend. 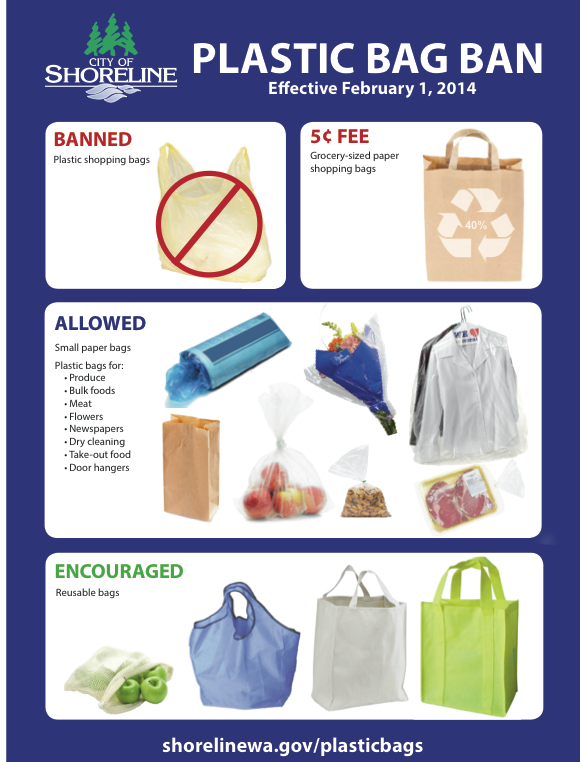 As of Saturday, February 1, 2014, retailers will no longer routinely give out plastic bags to shoppers, who will have to bring their own bags or purchase paper bags in the stores. Shoreline joins Seattle and Edmonds in prohibiting plastic bags in retail stores, joining the crowd of environmentalists who are concerned about plastic floating in Puget Sound and staying forever in landfills. The City cites waste reduction as the goal of the ban. The staff report to the City Council is here. Limited uses of plastic bags will be allowed for drycleaners, newspaper deliveries, wet or sticky items in stores, and take outs from restaurants. The regulations apply to all retail stores, including department stores, clothing stores, jewelry stores, grocery stores, thrift stores, pharmacies, home improvement stores, liquor stores, convenience stores, gas stations, restaurants, food vending trucks, farmers markets and temporary vendors of food and merchandise at street fairs and festivals, among others. Lake Forest Park, and nearby communities of Mountlake Terrace and Lynnwood do not have bans. Friday, Dolphie made it to the front square of Shoreline Community College's campus to raise the 12th Man flag with faculty and staff around campus. Everyone was in their Blue Friday gear to support the Seahawks as they go to Super Bowl XLVIII to take on the Denver Broncos. 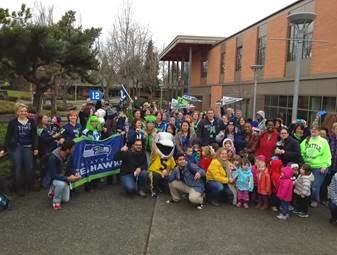 There are many Seahawks fans that were on campus today in their Blue and Green with Skittles and all! 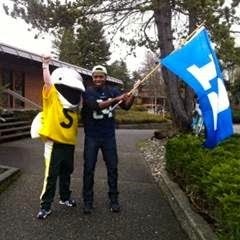 Shoreline Soccer player Ugo Obianozie even made it out for the action in his Seahawks gear to take a picture with Dolphie and raise the 12th Man flag. Be sure to watch Super Bowl XLVIII on Sunday and cheer on the Seahawks! Dolphie will also be cheering for your Shoreline Dolphins this weekend when they take on Everett Community College in Everett this Saturday at 4pm and 6pm. Bring your friends and family out enjoy the run and root on the Seahawks Super Bowl Run! Meet at 8am at the Richmond Beach Coffee Company, 1442 NW Richmond Beach Rd, Shoreline, Washington 98177. Arrive early to stretch. For more information contact Scott. While leading a discussion on electronic books recently, an attendee raised a question about security. He didn’t like the idea of having his credit card “on file” with the eBook retailer. Unfortunately, most providers of eBooks devices and applications seem to require this. I recently tried to download an eBook from Barnes and Noble. Though the eBook was free, they still required a credit card on file to complete the transaction. It’s not just eBook stores. Anyone who has a iTunes account, buys apps for their tablet or smartphone, or uses Google Wallet or a Starbucks card often has a credit card on file. In a world where purchases are made with a single button, giving out your card info has become a necessity. While there are legal protections against fraudulent charges, it is still uncomfortable to not control your own credit card. There are card companies who offer “virtual card” for customers in place of your regular credit card. CITI calls their program, Virtual Account Numbers. Bank of America’s service is ShopSafe. Both these services let you set payment limits and expiration dates from one month to 12 months, providing the period is within the expiration date of your regular credit card. 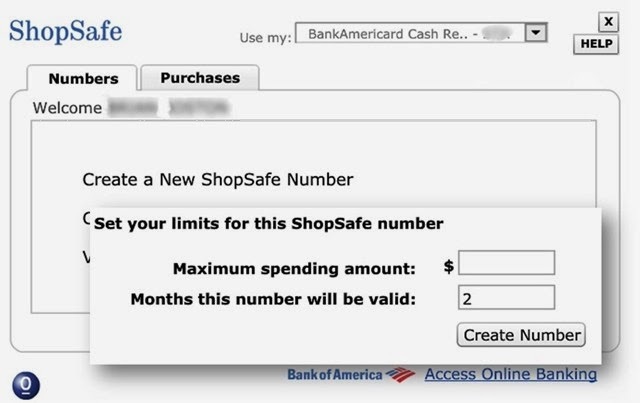 I used Bank of America’s ShopSafe and found that it works well, though finding the feature on the web was a bit challenging. To find Shopsafe in a current BoA account, go into your current credit card area after signing in to view your card activity. Then switch tabs to Information and Services. Finally click on ShopeSafe under Features to display ShopSafe’s activity window. From here you can create a new card number and manage any existing numbers you have created. The ShopSafe activity window is built using Adobe Flash Player which does not work well for some mobile devices like iPads and iPhone but should work fine elsewhere. When I have had problem displaying the window, usually closing the web browser and logging back into the Bank of America web will solve that problem. One requirement for ShopSafe card numbers is that they are tied to a specific merchant. Once you have used a card number to pay for something, that card can only be used at that place of business as a security measure. 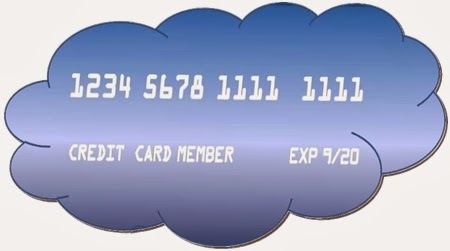 Fortunately, you have no limit in creating additional card numbers to use elsewhere. While prepaid credit cards provide a number of the same benefits as virtual credit cards, they may not be protected under the same liability rules as your regular credit card. You should check with your credit card vendor to confirm this and what kinds of virtual cards they offer. While virtual cards are great for online and telephone purchases, they do not include a physical card. As a result, you cannot use them for on-site purchases or a purchase that requires you to present your card to confirm merchandise pick-up. That said, it’s nice to have a card number in situations where you would prefer to limit the time or amount available. Do you have a technical question that needs to be answered or explored? Please share it with me at brian@bostonlegacyworks.com. Brian Boston supported Microsoft products during his 18+ years with the company and now teaches, consults, and troubleshoots a wide range of software and hardware devices for Boston Legacyworks. While Shoreline and Lake Forest Park are still in the early planning phases for the 185th and 145th stations for Sound Transit, ST has just launched a six-month pilot parking project at four of the existing stations to test permit-only parking for regular transit customers. Although the majority of parking spaces will remain free for transit customer use, a limited number of spaces will be reserved for the pilot program at Sound Transit facilities in Mukilteo, Issaquah, Sumner and Tukwila. Reserved parking areas at those stations will be clearly marked with signs and colored lines. Permit parking is being tested this year as they look at ways of making sure parking is available first and foremost for transit users in lots that are becoming increasingly crowded. After the pilot program ends this summer, the results will be presented to the Sound Transit Board for review and consideration of future steps. 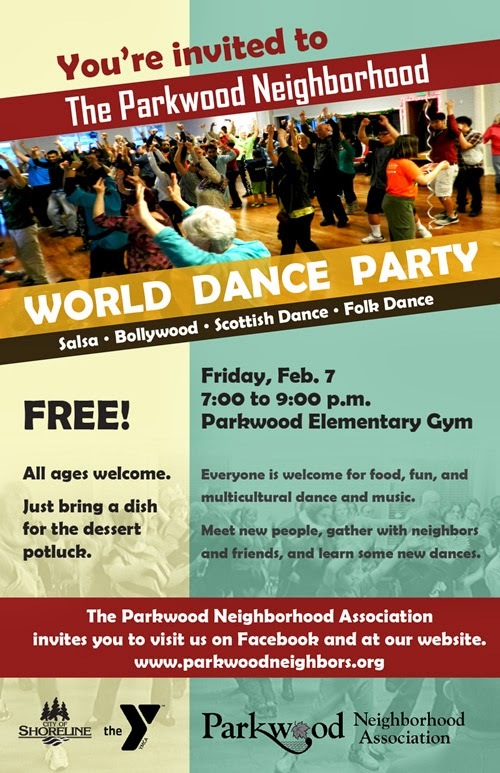 February 7 from 7–9 pm in the Parkwood Elementary Gym neighbors of all ages and abilities are invited to a fun night of multicultural dance and music. Volunteer dance instructors will be teaching Salsa, Bollywood, Scottish dance, and folk dance. It is free, but you are invited to bring a potluck dessert dish. To find out more about this event, or volunteer to help, visit the Parkwood webpage or email. United Methodist Churches in the Seattle Area, and several a bit farther away, have challenged their sisters churches in Denver to a Food Drive. The contest is to see which city can collect the most non-perishable food items between now and the Big Game which will see the Seattle's Seahawks playing the Denver's Broncos. Ronald United Methodist Church in Shoreline has already collected more than 200 canned food items. Donated food will benefit food banks. Canned goods from RUMC will go to Hopelink. The community is invited to participate. Canned food may be dropped off at the church through Monday. The church is located at 17839 Aurora Ave N, Shoreline, WA 98133. 206-542-2484. 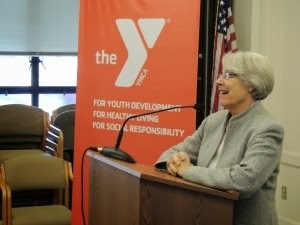 On Thursday, January 23rd, Rep. Ruth Kagi accepted an award from the YMCA as the organization’s Legislative Champion. Rep. Kagi has been an advocate for children and families throughout her entire career. The award was presented by Bob Gilbertson, President and CEO of the YMCA of Greater Seattle. While presenting the award, Gilbertson emphasized that Rep. Kagi has been a strong champion for children and families in the Washington House of Representatives. Gilbertson spoke of her passion, practicality and perseverance. “Even in the face of tough times, Ruth fights hard to build strong, safe communities for our children and families,” Gilbertson said. Rep. Kagi has served the 32nd legislative district in Olympia for 15 years, focusing on improving the quality of early learning and child care and strengthening foster care. Kagi credited the YMCA, pointing out that the legislature would not have accomplished nearly as much were it not for the support of the Y and similar organizations. She also mentioned the need for smart, dedicated public servants, and encouraged all the youth in attendance to one day run for office. The mission of the YMCA is to promote youth development, healthy living, and social responsibility. The YMCA is currently running its annual campaign. To donate call 206-363-0446 or visit the website. Kindergarten enrollment for Shoreline School District residents with students starting kindergarten in the fall of 2014 will begin on Feb. 3 at all K-6 elementary schools and Cascade K-8 Community School. In order to attend kindergarten in the fall, a child must be five years old by Aug. 31, 2014. All elementary schools and Cascade K-8 will have kindergarten visitations on Wednesday, Jan. 29 at 9:30am. 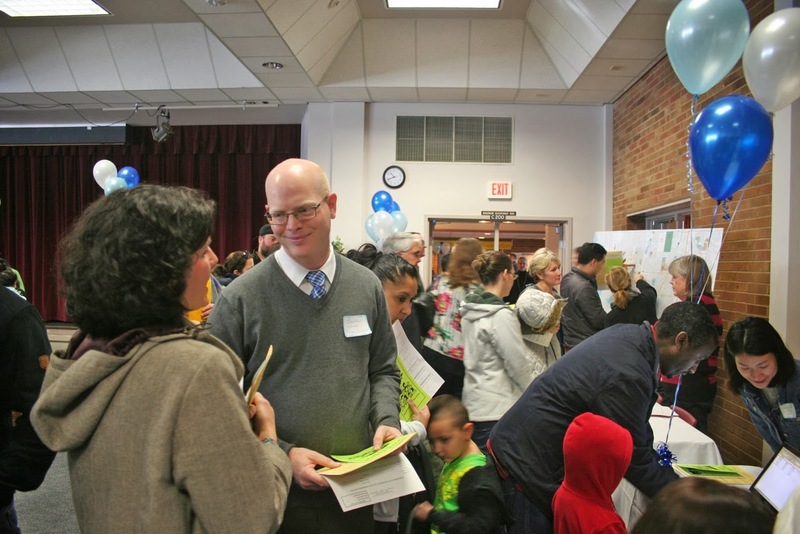 Briarcrest Principal Jonathan Nessan talks with a parent at Kinderfest. For students living outside of the Shoreline School District, kindergarten enrollment will also begin on Feb. 3. Enrollment and transfer request paperwork must be submitted to the Instruction Department of the Shoreline School District, which is located at the Shoreline Center, 18560 1st Ave N.E. The Instruction office is open between 7:30am and 4:30pm. For more information about kindergarten enrollment, contact Cathy Allred at 206-393-4211. No, that’s not a bad spelling of “polka,” folks. Polska refers to a type of Swedish dance dating back hundreds of years before the polka caught on, and it’s danced to 3/4 music (unlike the 2/4 signature of polka tunes). If you’ve tried the Swedish “hambo,” you’ve done a dance in the polska family. Likewise, Norway has a kindred dance called pols (e.g., Rørospols), along with other heavenly dances, called springar, which have complex, syncopated rhythms. Whether you favor waltz, polka, polska, pols or other types of dancing, Skandia Folkdance Society has a treat for hearts and “soles” on Friday, February 21. Come frolic at Vinterdans – a live music dance at Lynnwood’s Cedar Valley Grange, 20526 – 52nd Ave. W. Admission is $15. From 8 – 10pm, enjoy fabulous Nordic music and food. Five musical sets will give you ample time to practice or learn some steps and meet people who are happy to share music and dance traditions. Come and soak up the superb music, nibble on treats, and when the mood strikes, hit the dance floor for a fun mixer dance. And, if you don’t know a particular dance, you’re welcome to just walk in time to the music—or simply take in the magic from the sidelines. Please join me for polka, polska, waltz, schottis, hambo, springar, easy set dances, and more. See you at the Grange! 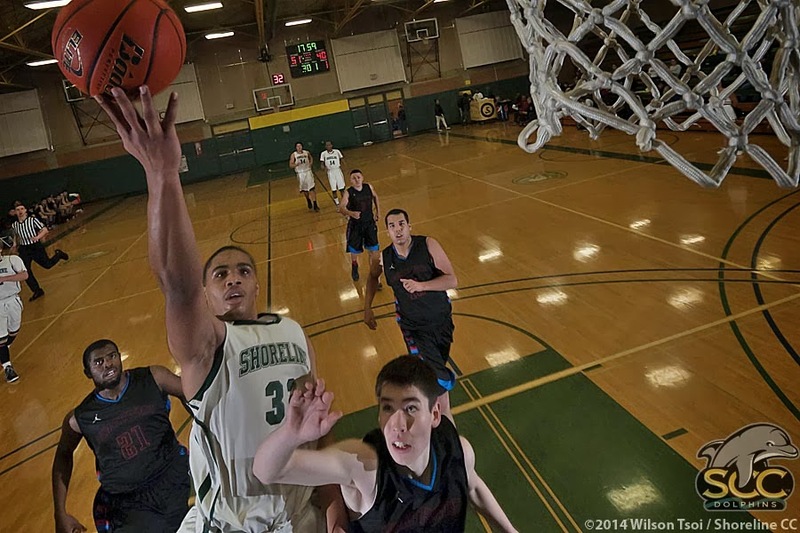 The Dolphins team would not be denied on this night as every member of the Shoreline club that stepped on the hardwood played with a purpose en route to a 97-87 victory over the visiting Northwest Indian College Eagles. These two teams have played previously in late November of last year. The closely contested match-up in Bellingham saw the Eagles race out to an early halftime lead, only to see Shoreline cut the deficit to one possession before the Eagles scrapped out an 86-83 win. There was a different ending this time, as the Dolphins kept pace with the Eagles in the first half. Bronte Corbray (Fr, Seattle, WA) led the way with 10 first half points on four of six shooting from the floor. Along with Corbray, nine other Dolphin players contributed at least two points to the cause. This type of production across the board was something head coach Greg Turcott felt could be a possibility. The dribble-drive style offensively allows for multiple players to touch the ball in areas that are conducive to scoring. The Eagles were led by 10 first half points from Kacy Green and Mike Schjang. Shoreline exited the locker room at half on a mission. The full court trapping defense gave Northwest Indian College absolute fits as they turned the ball over four consecutive times down the court at one point. As the Dolphins blitzed the Eagles relentlessly, Shoreline saw its lead balloon to 63-40 only four minutes into the second half. The Eagles would not go away as Mike Schjang single-handedly made play-after-play to keep Northwest Indian College within striking distance for the remainder of the game. Shoreline did not relinquish the lead as the Dolphins earned their fourth victory of the season in fitting fashion. Earl Thompson (So, Las Vegas, NV) scored 25 of his game-high 28 points in the second half as he continuously scored inside the paint. One play epitomized the leading scorer’s effect on the game more than any other as midway through the second period, Thompson muscled his way inside and finished an and-one-opportunity with Josh Nelson draped over his back. Thompson also snagged a team-high 15 rebounds, only one shy of his season high. Three other Dolphin players finished in double-figure scoring. Artez Scharer (So, Seattle, WA) chipped in 16 points on 50% shooting. Corbray and Austin Jordt (Fr, Big Fork, MT) contributed 14 and 12 points respectively. Dean “Bulla” Vienna (So, Waipahu, HI) helped out with 14 rebounds; 12 of those coming on the defensive end. Northwest Indian College was led by the dynamic back court duo of Kacy Green and Mike Schjang who tallied 24 and 23 point respectively. 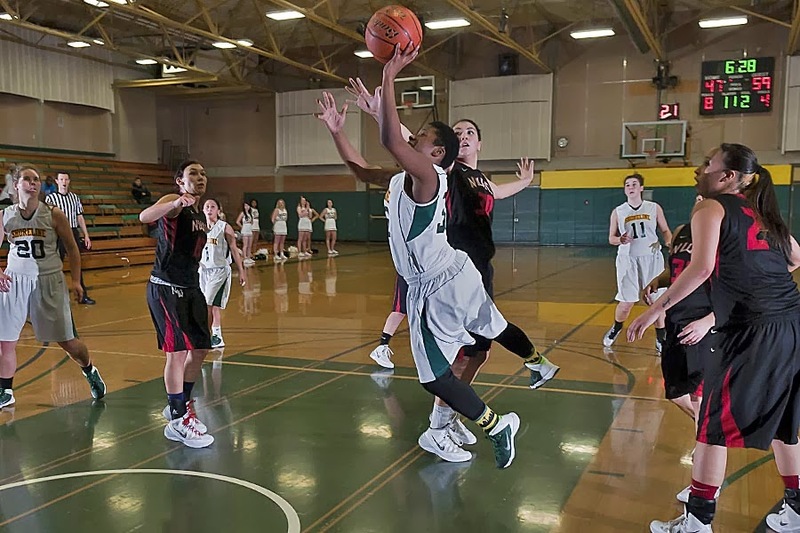 Shoreline Community College (4-15, 1-6) will look to start a winning streak when they travel to Everett Community College on Saturday, which marks the start to the second half of NWAACC play. Stat of the Night: Earl Thompson has now compiled six straight double-doubles and 11 for the season. The last game Thompson did not tally a double-double was on January 8th in a game against Bellevue College. For complete Dolphins schedule and results are available on the Athletics website. Watch all of our games on YouTube. Follow us on Twitter and like us on Facebook for daily Dolphin updates. The Shorewood boys’ swimming and diving team defeated Shorecrest 105-80 Thursday at the Shoreline Pool in the final dual meet of the season for both teams. 400 freestyle relay—Shorewood (Kintner, Hoverson, A. Landboe, T. Landboe) 3:26.27. View more of Wayne Pridemore’s meet photos on the Shorewood boosters web site. The Shorecrest boys’ swimming and diving team defeated Lynnwood and Meadowdale Tuesday in a home double-dual meet, and Shorewood lost at Kamiak going into a Shorewood victory over Shorecrest Thursday. Shorecrest defeated Lynnwood 145-21 and Meadowdale 119-51 in the double dual at Shoreline Pool Tuesday. Shorewood lost to Kamiak 105-80 at Kamiak High School. 400 freestyle relay—Shorecrest (Ruud, Jones, Ahern, Zevenbergen) 3:34.01. 400 free relay —Kamiak, 3:19.66. 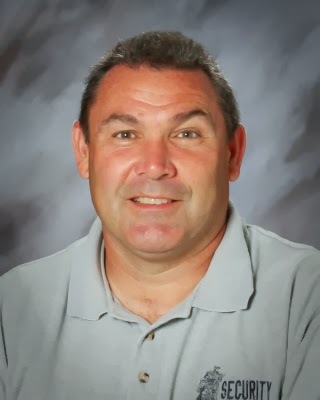 Drew Thompson, head boys soccer coach at Shorecrest High School, has been selected as the 2013 Northwest Sectional Boys Soccer Coach of the Year by the National Federation of State High School Associations. The Northwest section includes the states of Alaska, Idaho, Montana, Oregon, Washington and Wyoming. Thompson has been head coach of the Shorecrest boys soccer program since 2006 and is also assistant girls coach as well. He is in his 13th year as a security monitor at the school. The Scots won the State 3A championship in 2009 and were second in 2013. They have qualified for state tournament play in all but one of his eight seasons as head coach, winning three Wesco and four district championships. Prior to coaching the Scots, Thompson was head coach at Shorewood for 14 seasons. His overall coaching record is 254-104-50. Thompson was previously honored as the 2010 Washington State Boys Soccer Coach of the Year. In the early hours of January 24th, volunteers set out to conduct the annual point-in-time count of unsheltered individuals throughout the county. Volunteers scoured bridges, parking lots, and anywhere else they believed they could find someone living on the streets. This year's One Night Count showed a marked increase in individuals living without shelter in King County. The 2014 count revealed that 3,117 men, women, and children spent the night on the streets. This figure is up 14% from 2013's count of 2,736 people. These 3,117 individuals were each recognized with a strike of a gong the next day in Westlake Park by volunteers and housing advocates at an event organized by Real Change. 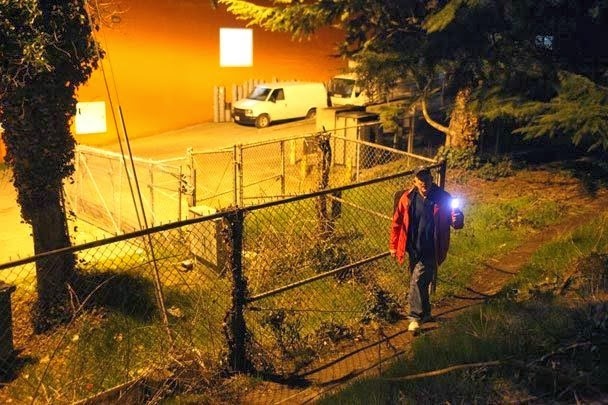 For the last 34 years, the One Night Count has helped inform the work King County has done in the quest to end homelessness. It also provides an excellent opportunity for volunteers to understand the extent of homelessness in our community. After the count, participants are encouraged to attend an advocacy workshop and lobby their local governments to provide greater systemic assistance in the fight against homelessness. For more information on the One Night Count, visit Seattle/King County Coalition on Homelessness' website. As required by RCW Chapter 42.30, Open Public Meetings Act, you are hereby notified that the Thursday, February 6, 2014 regularly scheduled meeting of the Board of Commissioners of the Shoreline Fire Department has been changed from 5:00 p.m. to 5:30pm at Department Headquarters, located at 17525 Aurora Avenue North, Shoreline, Washington. Northwest Indian College built a 39-24 halftime lead on the shoulders of Krista Colvin and Jolene Nagy who combined to score 27 of the 39 first half points as the Eagles held on late for a 66-60 victory. The Dolphins spotted the Eagles a 30-15 lead midway through the opening period in large part due to their inability to keep the Northwest Indian back court out of the painted area. Colvin and Nagy were able to penetrate through the 2-3 zone defense of Shoreline quite consistently in the first half, leading to a number of easy scoring chances. Genia Taylor (So, Kirkland, WA) kept the Dolphins a float in the first half as she performed solidly leading the way with five points and five rebounds. Justice Perry (Fr, Skyway, WA) also contributed offensively going two of three from the floor en route to four first half points and three boards. Northwest Indian College used aggressive penetration and timely transitional opportunities to force their way to the free-throw line where they successfully knocked down 13 of 16, which was the real difference statistically in the opening stanza. The Dolphins though as they have all season long would not go away lightly. Bianca Benavides (So, Tukwila, WA) scored the first four points out of the gate for either club and gave Shoreline some hope that they could get back into the ball game. The next few minutes would see both teams teeter back and forth, but the Eagles would maintain a comfortable cushion till midway through the second period. As the half neared completion Benavides tried willing her team back into the contest as she knocked down perimeter jumpers on three consecutive trips down the court. Shoreline would end up a few possessions short when the final whistle blew, but they battled during the second half, something that head coach Darnellia Russell can build off of as the second half of Northern division play ramps back up this weekend in Everett. Nagy and Colvin were too much down the stretch as they combined for 47 of the 66 points scored by the Eagles on the night. Benavides played the entire 40 minutes tallying 17 of her season-high 21 points in the second half as she tried desperately to stage a Dolphins comeback. Taylor also sported double-figure totals with 13 points and added eight rebounds. Shoreline Community College (3-13, 1-6) will head to Everett Saturday to continue NWAACC play as the conference slate resumes. The Dolphins will look to improve on their results from last time they played Everett, which ended in a 69-44 defeat at home. Stat of the Night: Bianca Benavides scored a season-high 21 points, bumping her season average to just under 10 points per game. Benavides also ranks in the top 10 in assists and has logged over 32 minutes a contest. 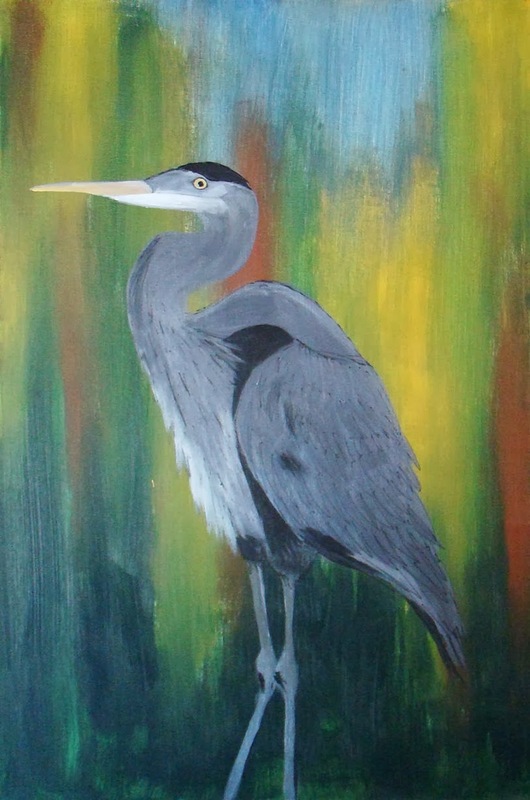 Nancy’s work is diverse, an eclectic mix of various mediums and styles through which to create an impression of something. Her process involves research, sketching in the field, imagining, and letting the creative process take over. Nancy studies many of the insects with magnifying glasses, and observes birds as close to them as she can get. 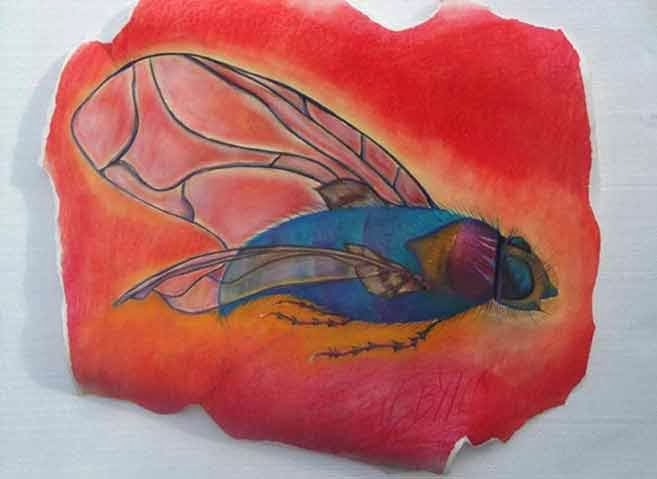 Her work has been exhibited locally and nationally, including at Lowell Art Works, Shoreline Arts Festival, and Chocolate Church Arts Center Gallery (Bath, Maine). The Quantum series was inspired by a Northwest crow. Michael began to contemplate an ongoing evolution in human creation mythology. 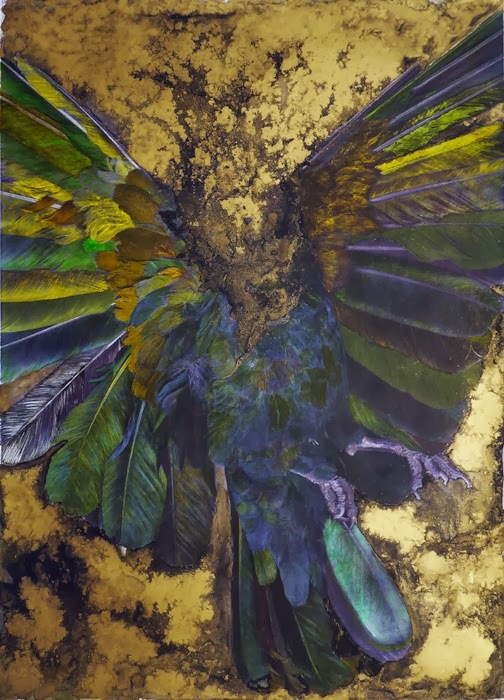 These mixed media works synthesize painting, photography and digital processes. Michael is a Seattle based artist whose artwork has been featured in many exhibitions locally and nationally, including the Schneider Museum of Art of Southern Oregon University in Ashland, the Ceres Gallery in New York City, Expressions Gallery in Berkeley, CA, and the Gary Manuel Gallery in Seattle. His work is in private and corporate collections, including the Marriott Waterfront Hotel in Seattle. Martha trained as a research scientist studying how animal behavior relates to the environment. While writing her university dissertation, she began making sculpture and has been creating art ever since. Whether working with metal, wood, or wire, she focuses on abstracting the qualities that make each subject an individual. Martha has exhibited in numerous exhibitions including at Fremont Abbey, Art/Not Terminal, Big Rock Garden Park, and Peace Arch Park. Antoinette was born and raised in Seattle, living in Ballard and Greenwood most of her life. She started her henna career, after apprenticing with a local henna artist in 2001. While working in henna, she developed her artistic style, which became strongly influenced by traditional Indian and Middle Eastern henna designs. Henna is traditionally a temporary art form. By transferring to canvas and acrylic, Antoinette has made permanent the intricate and delicate adornments used for centuries to beautify the human skin. In 2011, Antoinette opened a physical studio location in Greenlake, The Henna Shop on Latona. Jennifer is an award winning nature photographer. Growing up in Washington and traveling around the world inspire her to appreciate the beauty and diversity of the natural world around her. 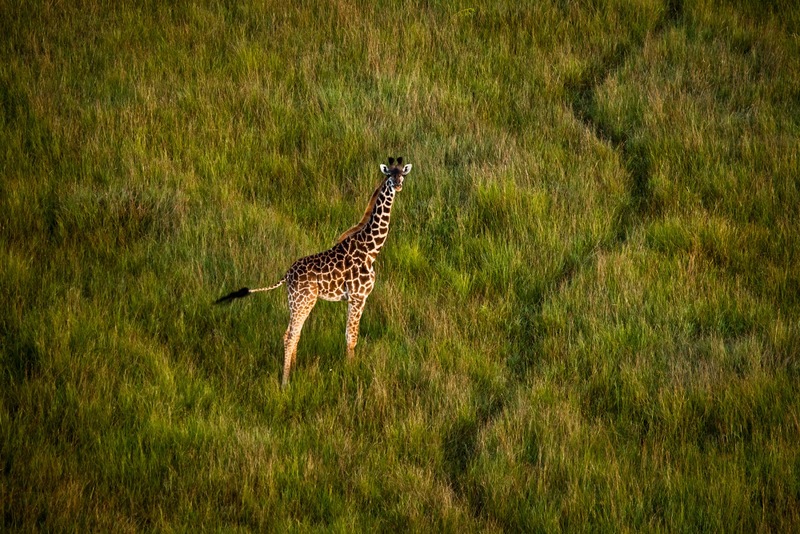 Her photographs are not digitally manipulated, and are all made in their natural settings and only of animals in the wild. She studied photography from an early age. And after graduating from Washington State University in 2005, she set off on her mission to preserve the world around her. Jennifer is a published photographer recognized for her attention to detail and masterful compositions. Shoreline City Hall is located at 17500 Midvale Ave N, Shoreline, WA 98133. For more information contact the Arts Council at 206-417- 4645. 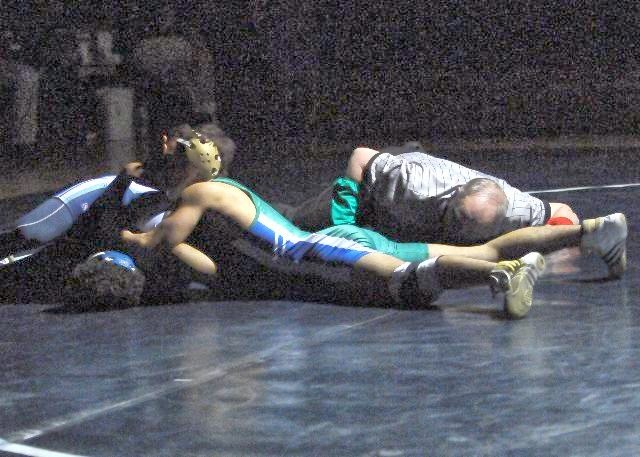 Matthew Floresca of Shorewood wrestling won the 113th match of his career this week. With a career record now of 113-9, Matthew has the most wins in Shorewood school history. Tim Hester, Class of 2008, held the previous record. The Shoreline City Council discussed alternatives to the 2006 Solid Waste Transfer and Waste Management Plan (Transfer Station Plan). The King County Solid Waste Division (SWD) is in the process of finishing its review of this plan to account for significantly lower revised tonnage forecasts completed in 2013. One of the main issues is whether or not to rebuild a station in North East King County which would cost one hundred million dollars to build and would raise customer rates countywide. Not building the station would result in significant saving to customers. 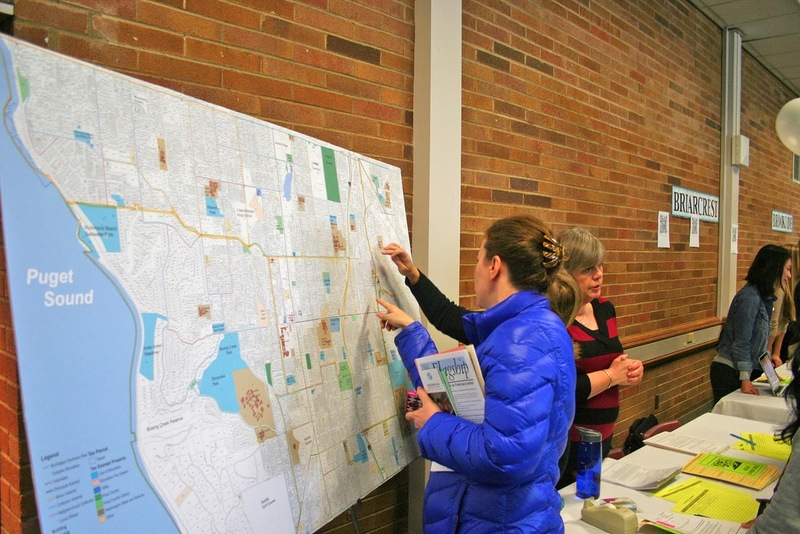 One of the options identified was to redirect some commercial traffic from the Factoria Transfer Station to the Shoreline Transfer Station (which has significant excess capacity) and the Renton Transfer Station (which would remain open) to balance use of the transfer station system. Deputy Mayor Eggen requested a study on the potential impact on Shoreline of more garbage trucks traveling on 175th Street and Meridian. But he said, “the change would be tolerable and not a huge issue considering it would save much higher rates.” Mayor Winstead and Councilmember McGlashan said they would sign the letter. Mayor Winstead said the garbage industry is changing with recycling and newer methods of garbage disposal such as waste to energy. Planning and Community Development Director Rachael Markle presented the draft Chronic Nuisance Ordinance for discussion and modification for potential adoption on February 24th. Currently, the City does not have regulations in place that provide adequate tools to hold property owners and/or their tenants responsible for correcting chronic nuisances when illegal activities and other code violations repeatedly occur on their property. Markle said in 2010 a house ion 169th Street in the Meridian Park neighborhood has been a problem with stolen property, raw sewage, disruptive behavior, and drug sales. It took thirteen years to resolve this issue because the parties involved could be sent to jail, for a short period of time and then be back in the house continuing with illegal activities. Although there would be no budgetary impacts to adopting the chronic nuisance ordinance, existing staff resources from the Police Department, Planning and Community Development Department, Community Services Division, and City Attorney’s Office would be impacted when the ordinance is utilized. However, it is anticipated that the utilization of a chronic nuisance ordinance will help resolve repetitive criminal and civil code violations more quickly at chronic nuisance properties, thereby reducing the total number of service calls and enforcement actions to those properties. Thus, the ultimate result may actually be a reduction in staff resources. 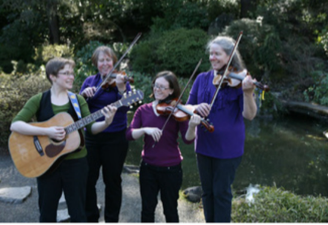 The Edmonds Driftwood Players or 425-774-9600, a nonprofit community theater, will award scholarships of $500-$1,000 each to deserving students for Fall 2014. Scholarships can be used toward tuition at any college in the US. Deadline for Application is May 1, 2014 (applications must be postmarked May 1, 2014). Applicant name, current address, phone number, and e-mail address. If a minor-parent/guardian name(s) and address(es) are also required. A list of high school or college extracurricular activities, and any awards or honors received. A letter of recommendation from your school’s drama teacher or other theater mentor. Transcripts of grades, including the 1st semester of senior year or latest quarter/semester of college. Date of awards ceremonies at your high school (if applicable). Recipients will be selected by an evaluation of the above information. All of the above information is required. Incomplete submissions will not be considered for scholarships. The Washington State Historical Society invites nominations for its annual awards recognizing excellence in advancing the field of history in the state of Washington through writing, teaching, historic projects, understanding cultural diversity and volunteerism. Help honor those who work to advance the Society’s mission “to make the study of history in Washington illuminating and inspiring” by nominating candidates for the following awards: David Douglas Award, Governor’s Award for Teaching History in Washington State, Peace and Friendship Awards, and the Robert Gray Medal. Awards will be presented at the Society’s annual meeting in June 2014. Nominations are due February 3, 2014. For nomination form and other information see their website or email Shanna Stevenson. Richmond Little League and North King County Little League are registering girls to play softball this spring. Little League Softball is an all inclusive sport that encourages "Courage, Character and Loyalty" and most of all, the players have fun! Spring will surely arrive when you see ponytails flying as the girls leap to catch the neon yellow ball, or you hear the crack of the bat and girls chanting in the dugout. Register your child ages 8-18 years for softball this season. Summer All Star softball teams are also formed at the end of the regular season for tournament play starting in in mid June. Learn to play! Enhance skills! Clinics are scheduled in January and February for players of all ages and abilities. Team practices start in March. Richmond Little League offers baseball and softball programs for boys and girls ages 4-18 years old who live or attend school within west Shoreline, west of I-5. Players who attend a public or private school that is also in this area may also play for Richmond Little League. North King County Little League serves families who live within Lake Forest Park and the eastern area of Shoreline, east of Interstate 5. ShoreDog is having a video contest. In a video, tell ShoreDog why you love Shoreline Dog Parks! Don’t forget to include your dog. Take a video and post it to the ShoreDog Facebook Page then join ShoreDog on February 4 at 7:00pm in room 301 in City Hall for a fun evening. View video contest entries and vote on the best one. You must be present at the meeting on February 4th to win! People’s choice award will receive a doggy gift basket sponsored by ShoreDog. Share your ideas for what ShoreDog should be doing this year. Meet other off leash dog area users and the ShoreDog leaders! Come learn how you can make a difference at Shoreline’s Off-Leash dog areas. The first will be February 8 at the East Side Off-Leash Dog Area, located at 1902 NE 150th Street. The second work party will be on March 8 at the Shoreview Off-Leash Dog Area located at 320 NW Innis Arden Way. Both work parties are from 11:00am to 1:00pm. Over the next few months Sound Transit representatives will contact property owners for approval to access private property in order to conduct noise monitoring, vibration testing/monitoring, geotechnical drilling and survey work. This information is needed to study, evaluate and document the potential impacts of the planned Link light rail expansion, complete the environmental review process and publish the Final Environmental Impact Statement early next year. Measuring noise at homes helps staff determine the potential impacts of future train operations. Noise monitoring equipment is placed outdoors on private property to collect data on existing conditions for 2-3 days at each site. Only surrounding noise is recorded as decibel levels, actual sounds or nearby conversations are not recorded. Access to homes and power is not required. To evaluate the potential for vibration from future train operations on nearby buildings and homes, vibration testing and monitoring will be completed. Monitoring equipment is placed in and around homes to record vibration data while staff and equipment are nearby during testing. Power generators may be heard and impact equipment may cause noticeable vibration during testing. Testing will be completed during normal working hours and each site should be completed in 4-5 hours. In order to study soil conditions, drilling or “borings” are necessary to collect soil samples for analysis. A drill rig and truck will perform borings and remove soil samples from each site. Each bored hole will be refilled and patched to match previous conditions as closely as possible. In accordance with all local regulations borings will be done carefully to avoid soil erosion and dirt or mud from leaking into surface waters, wetlands and drainage systems. Each site may take about three days to complete. Civil surveyors will gather topographical information and may leave paint markings or survey nails on the ground and ribbons in trees. Biologists will perform wetlands survey work and analyze plants species, hydrologic conditions and soils. Small holes may be dug but will be refilled. Survey flags may also be placed to indicate wetland boundaries and should not be moved. English speakers borrowed the word from French, where it traces back to the Old French verb "raconter," meaning "to tell." "Raconter" in turn was formed from another Old French verb, "aconter"or "acompter,"meaning "to tell" or "to count," which is ultimately from Latin "computare," meaning "to count." "Raconteur" has been part of the English vocabulary since at least 1828. Bonus recipe Baked Sweet and Spicy Wings – This Week’s Featured Recipe! Sun, Feb. 2 Try our Deli’s New Salsa! Go Hawks! 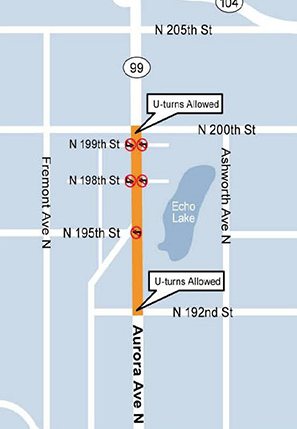 As part of the final phase of the Aurora Corridor Improvement Project, it will be necessary to remove some trees. The first group of trees to be removed is along Firlands Way N by N 195th Street. The two streets will be realigned to create one access point on Aurora for both. Approximately 35 trees will need to be removed from along the current Firlands Way just north and south of where Firlands Way intersects with N 195th Street. The realignment of Firlands and N 195th will create a safer intersection for vehicles and pedestrians and provide room to install a sidewalk. In addition, four trees on the west side of Aurora across from the Dale Turner Family Y will be removed to construct the sidewalk. Crews have placed Removal Notification placards on the trees to be removed. This final phase of Aurora improvements will install 238 new trees between N 192nd and N 205th Streets, adding to the over 900 trees already planted by the Aurora project. For more information about the Aurora Corridor Improvement Project visit the City webpage . If you have questions or comments, contact the Aurora Corridor hotline at 206-801-2485 or email. 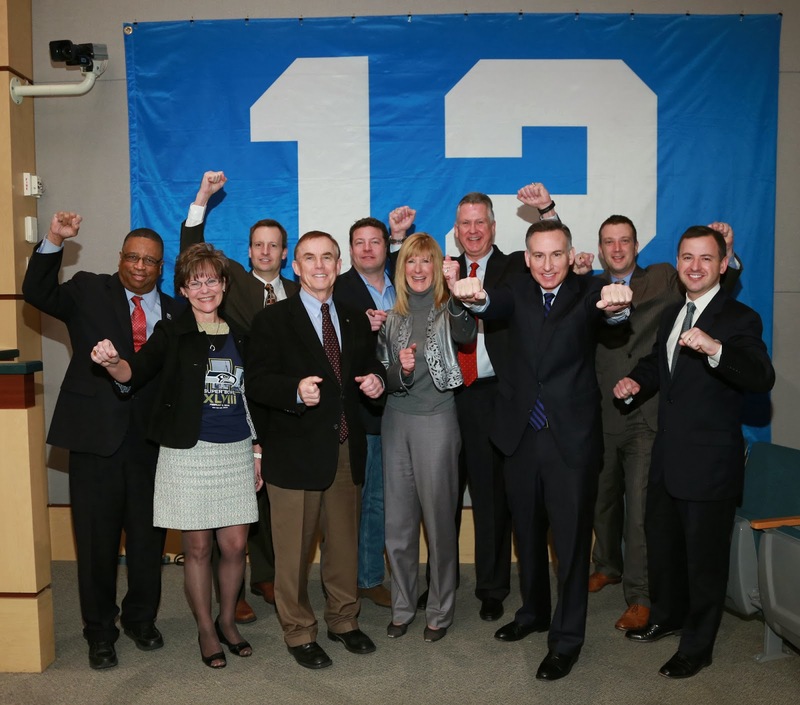 The Metropolitan King County Council and King County Executive Dow Constantine joined Seattle Seahawk fans throughout the Northwest—and throughout the United States—in showing their support for the Hawks as they prepare for Super Bowl XLVIII in New Jersey. In front of the 12th Man Flag that has been raised to show King County’s support for the Seahawks, the Councilmembers and the Executive sent a message to Denver Broncos fans: KING COUNTY IS BEHIND THE SEAHAWKS! !